The Bench comprised Justices P. Pathman Surasena (President/CA) and Arjuna Obeysekera. Petitioners cited Commander of the Air Force Air Marshal Kapila V.B.Jayampathi, Chief of Staff Air Vice Marshal D.L.S.Dias, Defence Secretary Kapila Waidyarthne and 13 others as Respondents. Sanjeeva Jayawardena PC instructed by Saranee Gunathilakaa appeared for the Petitioners. Petitioners state the Command Benevolent Fund was established for the purpose of providing welfare benefits to all ranks of regular and volunteer Air Force which provides Retirement Benefit soon after the retirement for any other reasons. With the introduction of the Retirement Benefit Scheme, the monthly salary deduction of the members of the Command Benevolent Fund was increased to grant greater retirement benefits and the monthly contribution was increased up to Rs 1750, they state. Under the scheme, once a member completes the deduction of the 36 instalments, he or she would be entitled to the total retirement benefits based on their category and the period of service, they state. 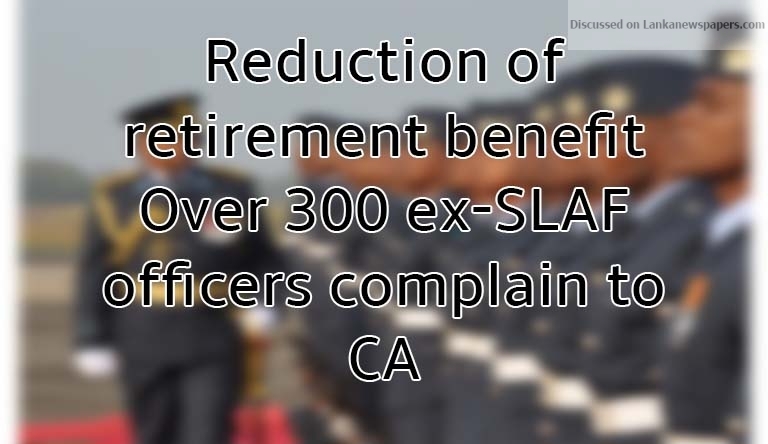 Accordingly, an Airman who has completed 22 years service and the 36 instalments is entitled to a total retirement benefit of Rs 1,000,000 whereas Air woman who completes 15 years of service and completes the 36 instalments is entitled to a total retirement benefit of Rs 750,000, they state. Thereafter the Retirement Benefits Scheme under the Command Benevolent Fund has been amended and the retirement benefit has been reduced, they lament. They complain that if the Fund fails, there has to be a serious negligence on the part of the then Board of Management of the Fund, they contend and that there must have been serious misuse, misappropriation or mismanagement of the Fund.